This time the lovely Sarah supplied a fun kit that she called 'Monster Madness' and fun it was! I am not so good at using cutie stamps but once I had a play I really did have a lot of fun. 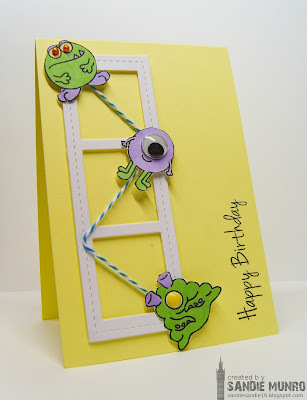 I used the patterened paper Sarah sent plus coloured in one of the fun monster images, adding the googly eyes and just stamped some balloons...kinda cute! 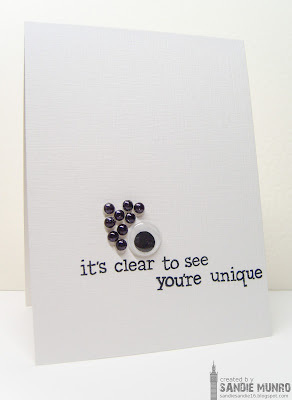 The idea for this second card came from fellow teamie, Coralynn, at AAA Cards. As soon as Sarah's pack arrived I remembered this card Coralynn had made which I loved. She very kindly said I could CASE it. And here is my version, practically the same with a few little twists-thanks for the inspiration Coralynn. Here I used the frame Sarah sent and more monsters with my basic colouring plus some googly eyes and the twine Sarah sent. Card number 1 and 3 really stretehed my creativity and I think not the my best cards but so much fun to do. Thanks Sarah for this. Duplicate images stamped, one on watercolour card and the other on copic friendly card. These are great! I love seeing you rise to this challenge as I know cute monsters are not you're usual style but you really made fabulous cards, that are still YOU. Oh my gosh...you rocked this kit! You made it totally you and they are all three fabulous! Adorable with a capital A! Sorry my comment is so late, the computer went kaput thankfully after my post went live. You did such a fantastic job with the kit. So cool to see my birthday card and I think you should use critters more, even though your not used to them. 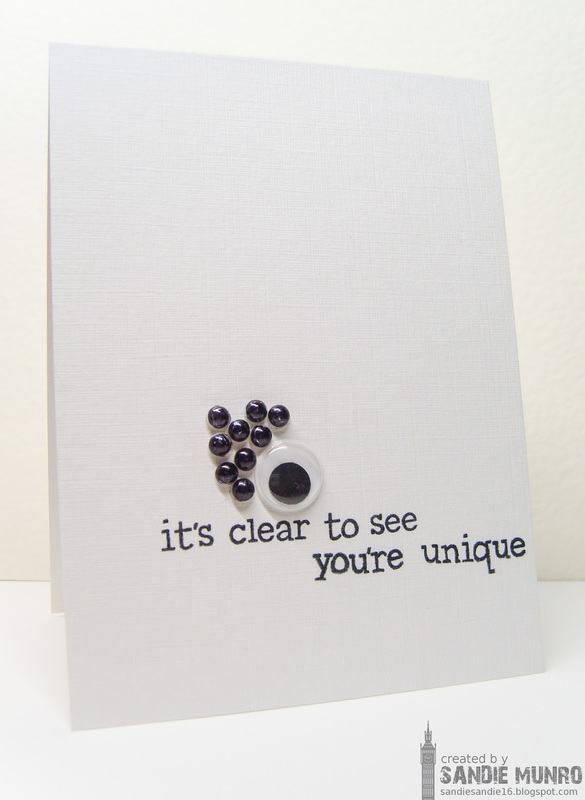 Love the second card with the googly eye, its so you and the way you used the twine was such a brilliant idea. It was such a fun kit, Sarah did a wonderful job. Wonder what the next one will be like???? Mwah! Too darn cute...love your fabulous cards and those monsters are so amazing! I love your normal ultra CAS style, but I find it really inspirational to see what you create when forced out of your comfort zone. I'm experimenting with a lot of styles, the one layer is my ultimate non comfy zone, but it's rewarding when occasionally I manage to make something I'm proud of in that genre. I think you did great! OH MY GOSH! Sandie!! One would NEVER know you struggled with these funny cards! Well done! 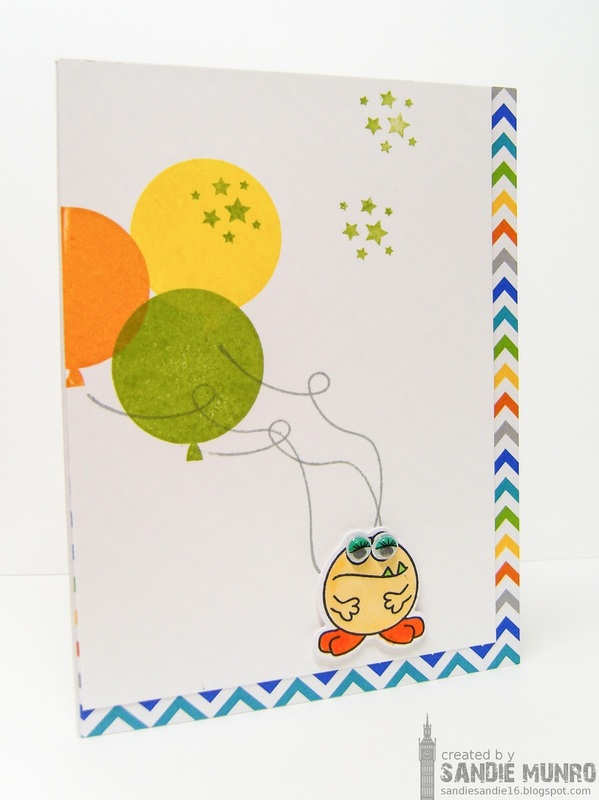 What a fun kit you received, and I really admire how you stretched yourself creatively to come up with 3 fantastic and adorable cards.